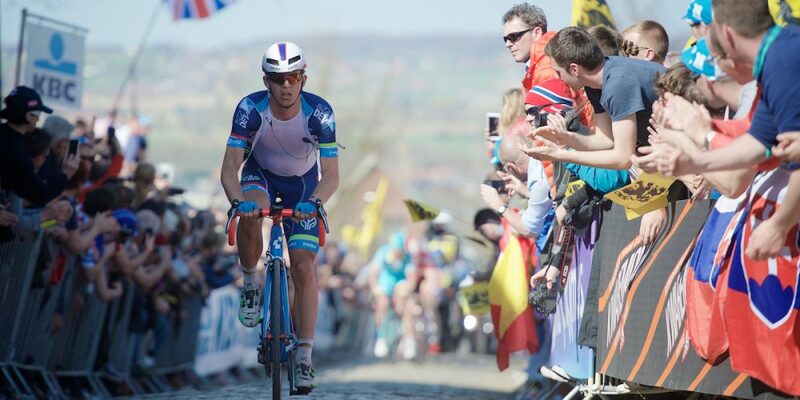 After an impressive minute of silence and an applause on a packed Bruges Market Square for Antoine Demoitié, Wanty-Groupe Gobert reacted with a fitting salute to Antoine via Dimitri Claeys’s ninth place. “I was very motivated to do something for Antoine and for Daan (Myngheer). We missed the early break but made up for that in the final of the race. Peter Sagan and Sep Vanmarcke were just too strong so I couldn’t follow them but then I wanted to sprint as well as I could to get a good result,” Claeys declared. “Our goal today was to anticipate and Dimitri did just that by riding to the front with Gruzdev when the gap of the breakaway was down to a minute. On the Koppenberg a group gained ground on the leaders fast but we had Marco Marcato well-positioned in that group so that was reassuring,” sports director Hilaire Van Der Schueren explains the plan of the day. Marco Marcato was the team’s second rider in the top 25 of the Tour of Flanders. “In the final, on Koppenberg, I tried something but it was Peter Sagan himself who closed the gap,” Marcato tells his story of the day. Wanty-Groupe Gobert’s next cycling monument is just around the corner. In seven days the team starts in Paris-Roubaix. “Today’s race gives me confidence for Paris-Roubaix. I know I can be there in the first 20. Paris-Roubaix is very special. We have a very strong team which is really motivated after a top ten in one of cycling’s monuments. We are all a bit more relaxed now, have more confidence and we will improve with every race,” Marcato concludes.